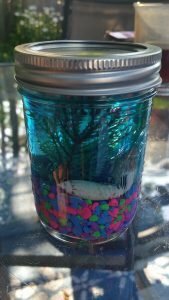 I did this aquarium craft in our summer camp program with children ages 5-13. It was a big hit, they all enjoyed the craft. If you work with kids you know that finding something they all like is hard, but this worked. It was fun and easy to make. The kids couldn’t wait to take it home. I also did this craft at home with my niece aged 11 and my daughter aged 2, they both enjoyed making it too. This is a great craft to do with a large group of children or a small group. This craft can also be part of a summer birthday party or an under the sea theme party. 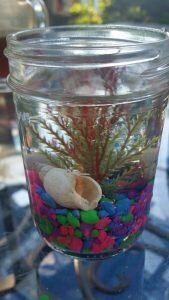 Follow the step-by-step directions below to make your very own aquarium. 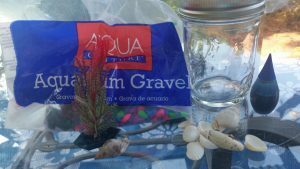 Step 1: Fill your jar 1/4 with the aquarium gravel. 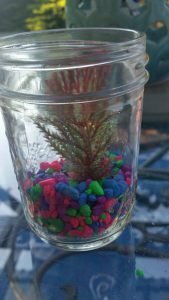 Step 2: Place aquariums plants into your jar. I used one per jar. Depending on the size of your jar and plant you may need to cut them down a little so it will fit. Make sure the bottom of your plant is completely covered by the rocks. 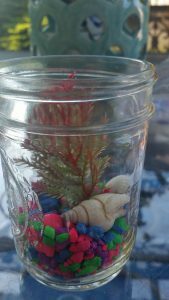 Step 3: Place a couple of tiny shells into your jar. You can buy them or find some at the beach. You can also add in other items such as a treasure chest or scuba diver. 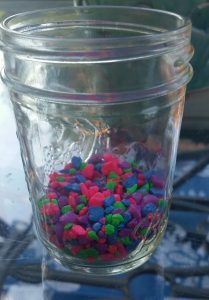 Step 4: Fill your jar with water and add 1 drop of blue food coloring at a time to get the color you like. It is very important to add one drop at a time. You may only need to use one drop. Materials for this project are available on Amazon. Click on pictures below to reach Amazon.